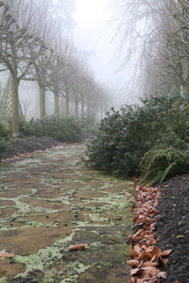 A few weeks ago (in December) the whole garden and estate was shrouded in fog for days. Flights started to back up at the airports, and the whole world had gone quiet. 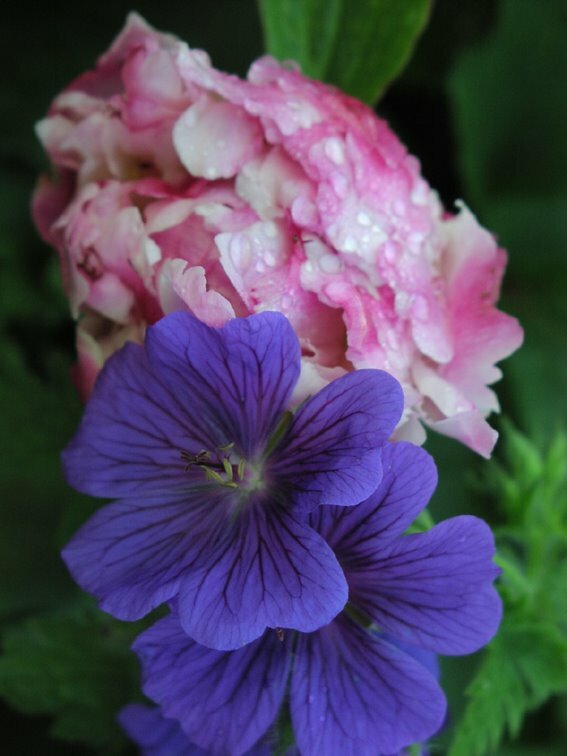 High pressure does a wonderful job of creating a sense of stillness and quiet in the garden. 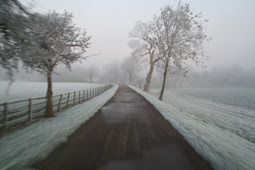 I love this atmosphere, even though its so cold going down the drive on the bicycle! 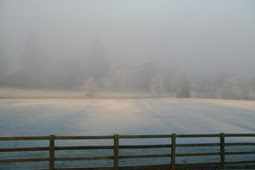 Then the sun starts to seep through the murk and walking around the garden looks completely different - I guess you are only focusing on the ground as these is a white blanket above, so details seem to jump out at you much more. 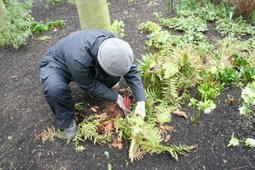 There is little you can do outside on days like these where the frost doesnt lift, so its a good chance for us to tidy the greenhouses and vinery. 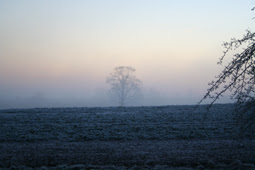 We are getting later and later frosts these past few years, so the first frost now seem to occur in November, rather than October. 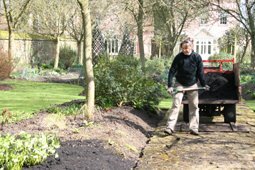 This helps prolong the colour in the borders, although as the winters are now effectively shorter, this leaves us with less time to thoroughly clear the borders - yes, it really does take about 4 months to tidy, clear away dying foliage, weeds, move stray plants and fork over the all the beds at Toddington Manor. 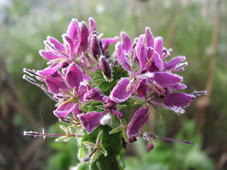 When we have the first frost it always seems to catch me by surprise - the summer evenings seem so recent and the borders still look good. I always keep a close eye on the water forecast so all the large summer pots placed around the garden with tender margurite Daisy's are all safely tucked away in the frost free vinery. 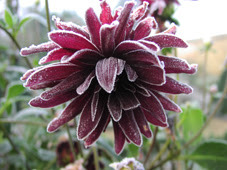 The dahlias and cleomes still look great while the frost is still on them, but tomorrow morning all the cells will have been ruptured and turn the whole bloom to a dirty sodden brown lump - not so attractive! 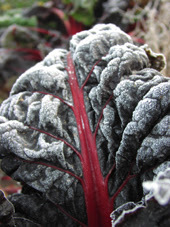 Our rich red rhubarb chard will not suffer so badly - the outer leaves may be for the bin, but the inner leaves will still be able to be harvested. 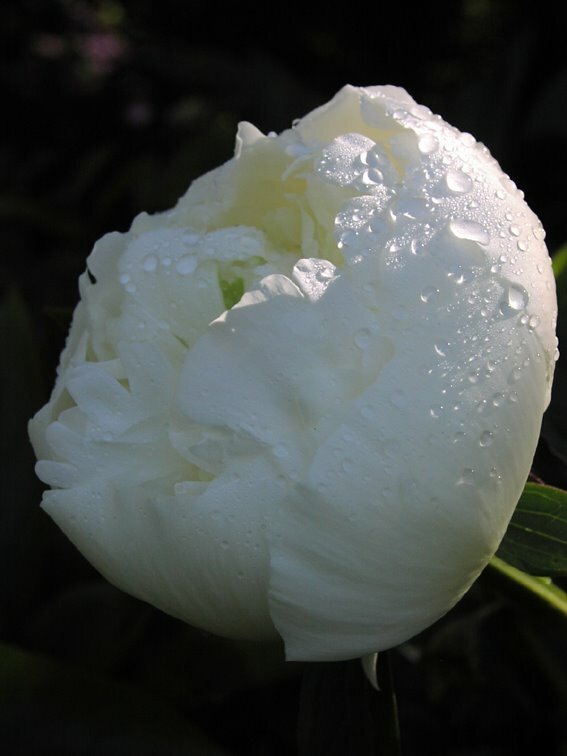 In fact, this is one ornamental vegetable I would not be without in the ornamental potager. 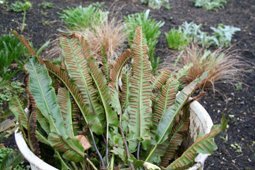 It seems to tolerate heavy rain, drought, pests leave it alone, it is easy to germinate, looks gorgeous whilst patiently sitting there waiting for a gardener to harvest the rich red, crinkly leaves. It is even listed as a super food along with the equally spectacular kale. They both have an 'acquired' taste, which basically means they are both quite bitter compared to the ordinary vegetables you can buy at the supermarkets, but combined with other vegetables, especially in soups, they are really quite good. 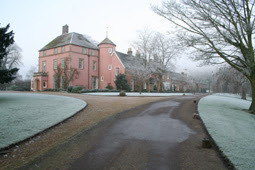 Have been very busy of late with another project, but have found a little time over the holidays to update you all on whats been happening over the past couple of months at the Manor. 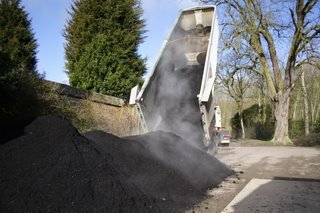 We have had a very windy Autumn in Toddington this year. Not so good for gardeners as working on days when the wind incessantly blows can really wear you down somehow - the gardeners have been talking about this and the end result was that if you wear ear defenders whilst weeding, it doesn't affect you at all, so it must be the noise that makes your head 'busy'! Feeling pretty daft while wearing them though!!! 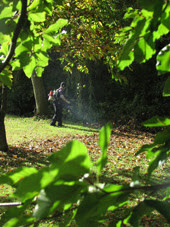 Its lovely when the wind blows when the leaves are falling though, as we use petrol powered leaf blowers to move the leaves of our lawns, (which means wearing the aforementioned ear defenders.) Otherwise the worms end up dragging them down under the soil, and really makes the lawns quite messy. Also, the leaves collect in sheltered corners and if left to sit there for more than about a week the grass underneath will yellow and even die eventually. Growing Ratatouille in the greenhouse! 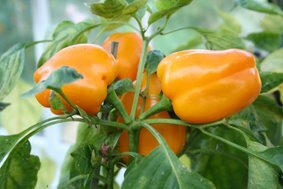 As this summer has been so long and warm, the vegetables we have been growing in the greenhouse have loved the conditions and we have harvested a wonderful crop. 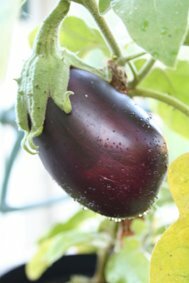 The Aubergines are swelling bigger and bigger and the colourful peppers are ready to be picked. We have been growing a colourful selection this year including some black one, which eventually ripen to bright red. Whitefly has been a bit of a nuisance through the summer, but we have controlled this organically by spraying soft soap onto the underside of the leaves, where the whitefly tend to collect. Watering need to be regular and using tomato feed on all the plants each week has helped the plants to crop well, and stay healthy too. 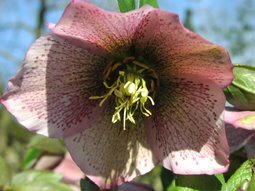 All of these plants can also be grown in a sunny sheltered spot in the garden, but will benefit from a period in the greenhouse in spring to give them the long growing period they prefer to fruit well. A bumper crop of tomatoes were grown, again relishing the long summer, and the sweet gardeners delight were delicious. 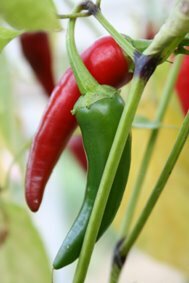 Another easy crop we grew were the chilli peppers. They not only look fantastic, but add a real kick to the ratatouille! 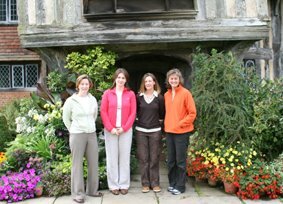 Every year the Gardeners enjoy a treat- a day out visiting a garden with the owner of Toddington Manor, Lady Bowman-Shaw. 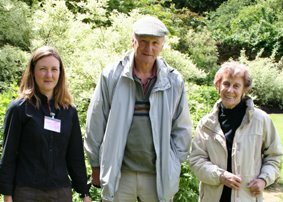 This year we all agreed that Great Dixter, home to Christopher Lloyd who passed away earlier this year was to be the one. It was a girls only day out for Barbara, Debi Rachael, Lady Bowman-Shaw and myself, as Tony was waiting for his new baby to be born imminently! Just as we arrived the heavens opened and we had to wait for the rain to pass, sheltering under the precarious old entrance porch. 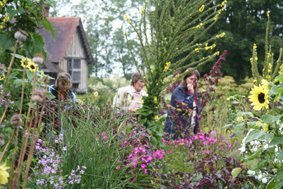 We then thoroughly enjoyed looking around the garden, trying to identify plants we were unsure of, and appreciating many of the sucessful plant partnerships that Great Dixter is so well known for. 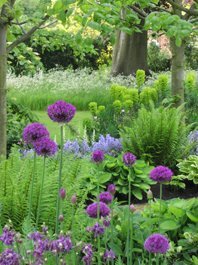 Many of the combinations rely on annuals, bulbs and half-hardy perennials being planted out throughout the year, so although it looked fresh and colourful, we all agreed it looked like continual hard work! The main parts of the garden were in the main quite traditional, although with flamboyant use of colour, while at the front of the house, the exotic garden and the cactus juxtaposed against the 15th century manor house caused many comments as it was so much fun. Many of the plants were tender, so were unfamilar to the gardeners growing outside, but everything looked healthy and well cared for, obviously loving the hot summer we have had this year. We always have a notepad to write down ideas for Toddington Manor, and we are definately planting more crocosmias for next year, Crocosmia 'Citronella' caught our attention, and Atriplex hortensis var. 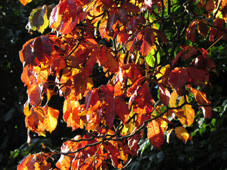 Rubra looks like an annual well worth planting, and an unusual elder, Sambucus formosana with fantastic orange berries. At the back of our quintessential English Croquet Lawn, we have a border we call Umpires bank. Whether or not the game of croquet has an umpire, I am not sure, but it is called this because originally there was a rather awful hard surface tennis court surrounded by an equally attractive chain link fence. When the owners children were young, this was a great addition to the garden, but as they all grew up and moved away, it was not really getting much use. So Robin, the previous head gardener replaced this with a croquet lawn, which transformed this area. As the fence was removed, umpires bank became more visible, so we have improved the planting here. 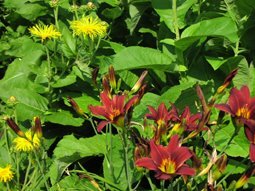 As it is viewed from a distance, bright colours add impact, such as the wonderfully statuesque Inula magnifica, and brick red day lilies. 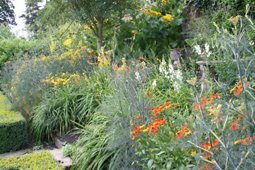 Orange-yellow Helenium 'Waldtraut', evergreen punctuation marks of Hypericum 'Hidcote' , feathery plumes of bronze fennel and two Laburnums stand sentry each side of the umpires bench! 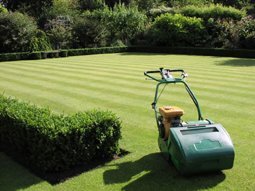 The croquet lawn has suffered this year because of the drought, and although we have not got a hosepipe ban in our area yet, the searing heat has meant the lush green sward of last year is a memory at the moment. But grass has the wonderful ability to start growing again as soon as the weather becomes kinder to plants again. 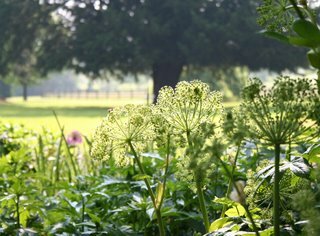 Toddington Manor has a wonderful backdrop - many established specimen trees planted by the previous Victorian inhabitants. 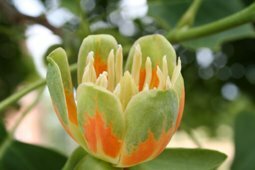 One of these is a fine example of a Liriodendron tulipifera, you can see how large it has grown in the photo. 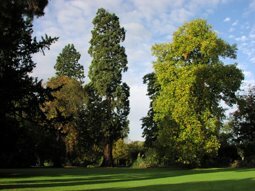 It is on the right hand side, on the left is a wellingtonia (Sequoiadendron giganteum) and a Red Horse Chestnut (Aesculus x carnea). 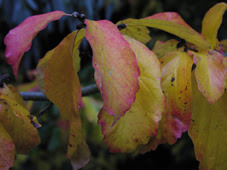 It has now finished flowering, but many visitors merrily walk past it without looking up, missing the hundreds of flowers tucked between its leaves. 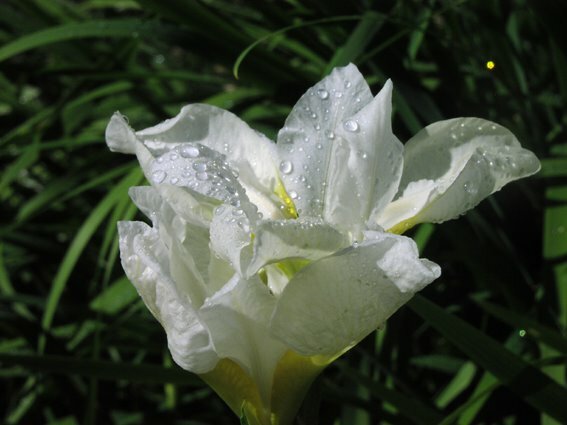 As they are a similar shade of green as the leaves, from a distance, the flowers just look like browning leaves. 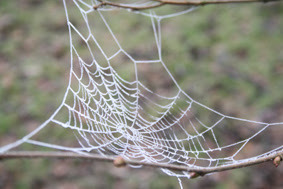 But up close - wow! Immediately you can see where the common name originates from. The flowers last for just about a month during June and are about the same size as an average tulip flower. Also worth mentioning are the unusual leaves, with lobes and a notch at the tip which makes it look like it has been cut off. These turn a lovely buttery yellow in Autumn. 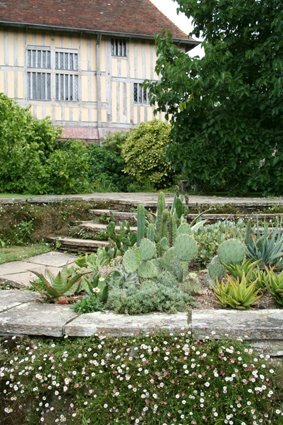 Our ornamental potager at Toddington Manor is growing away now, after dire weather for the first six weeks or so. 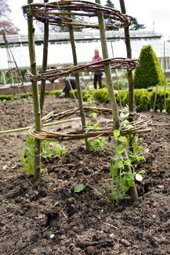 This is Rachaels (our WRAGS trainee) project this year, to design a planting plan, which was colour themed with rich purple and reds, along with creamy white cut flowers such as ammi major, antirhinuums, helianthus 'Vanilla Ice' and wonderfully scented sweet peas - 'Beaujolais' and 'Mrs Collier'. 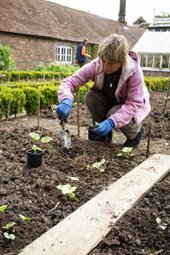 Earlier on May 2nd, we organised a workday for the WFGA (Womens Farm and Gardens Association) to plant and sow our potager. 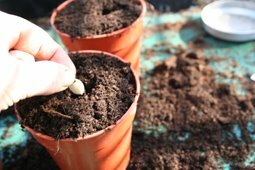 Members pay a small fee to attend the workday, and have chance to be taught new skills, we manage to complete the sowing and planting in one day, and we all enjoy the cakes! 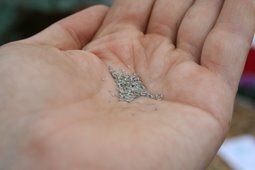 The gardeners had started sowing seeds back in March in the greenhouse so a few plants have a head start before being planted out in modules. Others were sown direct into the prepared soil. Rain followed the following day, and was followed by cold wet horrible weather for the next two weeks - not great conditions for seeds to germinate. The plants sat and sulked also, until the sun came out, and for four weeks, baked dry under the relentless hot sunshine. 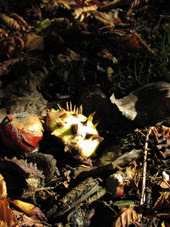 But nature has its own way of dealing with these trials, and although, as the photo shows, it is a little bare in places, it will catch up and be as beautiful as it was last year. 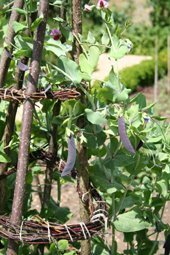 The sweet peas , mange tout (the curiously named 'Ezethas Krombek Blauwschok'), ammi major , euphorbia oblongata are all flowering well, and as I write this, the vase of sweet peas smell wonderful! 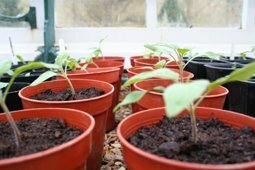 We sowed our Tomatoes on 6th March in a heated propagator, by 21st March they were ready to prick out into larger, individual pots. The trick with tomatoes is to keep them moving itno a bigger pot as soon as the roots have filled the pot - without letting them get potbound. Three pot sizes later.... and they also needed tying in to a cane, to stop them falling over. 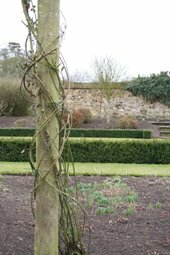 We create a neat figure of eight using string, and not too tight as the stem will expand as the plant grows. 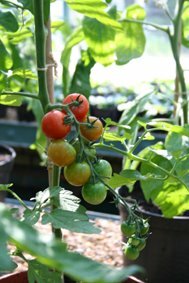 All our varieties are cordon tomatoes or indeterminate, which means the main shoot will continue to grow - given its own way. 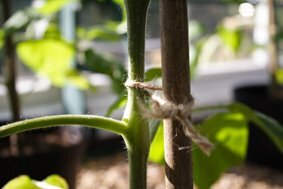 However, the growing tips will be pinched out after a certain number of fruit trusses have formed depending upon whether it is growing in the greenhouse, vinery or outside. 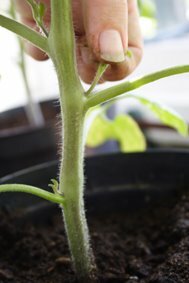 With this type of tomato, the side shoots need removing so growth is directed into the developing fruit, not excess foliage. At the axil of each leaf the tiny shoot is just pinched out with my fingers. If you miss one, it will get quite large quite quickly, so be sure to keep a eye on them! As they need watering most days in the warm weather it is easy to look along the stem each time to see if any need removing - and you enjoy that lovely scent of tomatoes each time it is bruised - takes me back to my childhood each and every time! 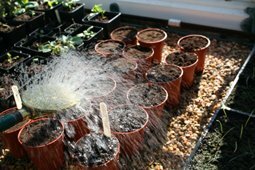 Constant watering is best - they dont like being either waterlogged or too dry, but a little every day ensures the fruit will not be prone to splitting. Also, we spray a few whitefly with insecticidal soft soap on the tips. 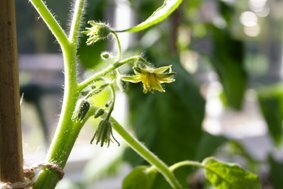 10th of May, so about 2 months after they were first sown, the first exciting tiny green tomatoes are developing now - we now start feeding every two weeks with a high potash feed to ensure the best quality crop. Plenty of high temperatures and sunshine means the fruit grow quickly and start to ripen, the first to turn red is Sakura F1, and looks like Gardeners Delight will be next, all by the 8th June. Picked fresh and warm from the plant, a quick wipe on my sleeve - I really should just check if they are fully ripe yet!!! One of our many Paeonies, the white cultivar 'Duchesse de Nemours' just opening in the morning sunlight. You can't get a more sumptious combination than this! damp soil and some shade. 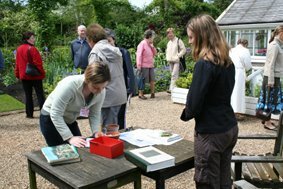 Our Annual Garden Open Day was a great success, with over 600 visitors to the garden. The weather was how you would describe as 'changeable' with a few short, sharp showers for good measure, but spells of welcome sunshine too. Still too nippy for the end of May though! As all 5 gardeners were helping on the advice desk and selling plants we had propagated ourselves, we were able to sneak out for a visit to the other gardens in Toddington that were open on the same day. The ones we managed to visit really were quite varied and different, and in each one, there were ideas that could inspire other gardeners, be it how to deal with a difficult shady spot, awkward levels, tiny spaces or recycling in the garden - gardeners are the most inventive people out there, I am sure. Then a lovely lady introduced herself as a evacuee in the Second world War, who arrived with her mother and 5 brothers and sisters to spend the duration of the war in the safety of the country, while bombs were being dropped on London. Again, a lot of changes have happened, but the memories were fascinating to hear. 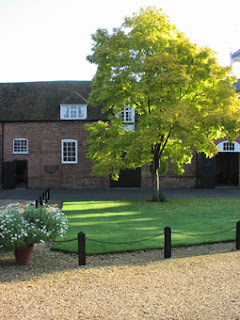 It is great for people to make the effort to revisit the Manor that have a place in their family history, and to hear their stories.